Top 4 week on American Idol Season 14 was off to a great start right out of the gate for one simple reason: no more Twitter “fan save!” Beginning with this week, we’re back to the weekly vote count being all that actually matters. Two songs for each contestant this week. First up, songs from the “Judges’ Hometowns” (Jennifer Lopez: New York, Harry Connick Jr.: New Orleans, Keith Urban: Nashville… even though he was born in New Zealand). Second theme, songs that represent the contestant’s “gravy,” or “soul” (whatever that means). Coolest revelation of the night: both Jax and Nick Fradiani have pet dogs named Jeter. What are the odds? But the real theme of the night seemed to be, incomprehensibly, “Beat Up on Clark.” What was up with that? 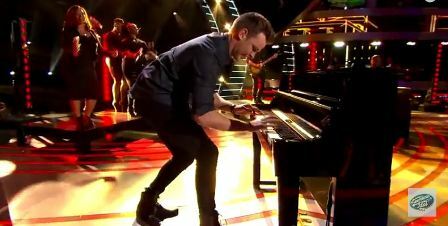 From the judges to guest mentors Rascal Flatts to permanent mentor Scott Borchetta, everyone seemed to have it out for Clark Beckham. More on that later. Clark did an admirable job with this Wonder classic, singing with passion and precision. His bluesy keyboard solo was a nice addition, but the staging was a bit awkward as he had to run back and forth to play it. Maybe a half-step lower would’ve suited Clark a bit more comfortably, but it was a strong performance nonetheless. Harry correctly noted that Jax was a bit hoarse tonight, but also praised her for powering through it. 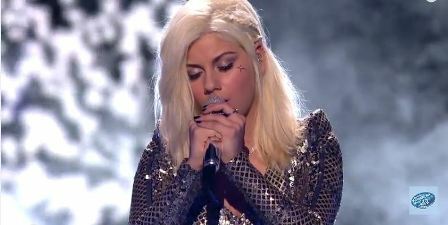 This was a confident vocal and one of Jax’s strongest so far. Nick isn’t distinctive in any way. He pretty much defines “middle of the road” blandness. But he is consistent. Does the world really need a Rob Thomas sound-alike though? Harry Connick Jr. performed “City Beneath the Sea” at the keyboard. I wouldn’t have personally picked this tune out of all the songs he’s written (even out of his tunes specifically about New Orleans), but he did a solid job. It’s a bit hard to hold this total mess of a performance against the talented Tyanna because for some unfathomable reason they decided to reveal her elimination at this point. Why not hold the big reveal for the end, letting all the contestants believe they’re in jeopardy? That said, this was an awkward and forgettable farewell performance. Harry nailed it here, Rayvon connected completely with this ballad. That truly is Rayvon’s strong suit: sincere balladry. He does it very well and that’s what has kept him in the competition week after week. Martina McBride performed “Over the Rainbow.” Yawn. The big controversy of the night. In Clark’s pre-performance video, we heard him vehemently defend his song choice in the face of aggressive negativity from Scott Borchetta and the Rascal Flatts guy. “If this [song] loses it for me, I don’t want to win,” Clark defiantly stated. The performance was a smooth-grooving soul reinvention of a country favorite (popularized on Idol by Season 10 champ Scotty McCreery). It was inventive, daring, and fearless – plus Clark stepped aside for a tasty guitar break. Apparently influenced by Borchetta’s naysaying, the judges pig-piled on Clark for taking a chance (and succeeding, for which he received no credit). Clark demonstrated real artistry here and delivered a convincing defense of his performance after the judges raked him for it. If Clark had done this a few weeks ago, I believe the judges would’ve been all about it. The Judges’ Take: Harry – “This is a perfect example of the technical versus the emotional. There were pitch problems all over the place.” Heck, all the judges found it was very emotional. This was pretty weak, with Jax’s vocal problems seemingly getting the best of her this time. Harry gave her a free pass on pitch problems (which he usually does). This was Jax at her most indulgently over-dramatic. Her staging, what with the smoke machine and kneeling on the stage, overshadowed her performance. On a personal level, I’m not always wild about Rayvon’s song choices – especially this one. But objectively, this was another well-sung ballad that plays right into Rayvon’s strengths. Again, Nick wears his bland adequacy on his sleeve. He’s winning votes for being competently, boringly consistent. He has a knack for picking songs that suit his limited voice (both in terms of range and expressiveness), but there’s no spark there. In a season dominated by the elimination of the most eclectic, versatile performers, Nick would make a suitable winner.